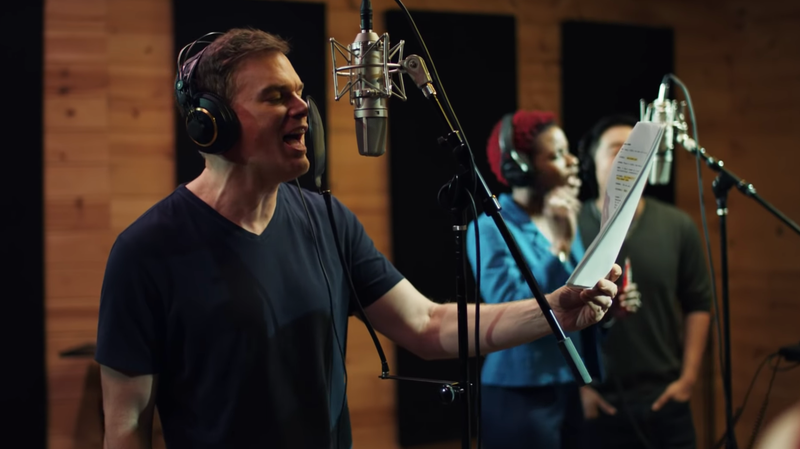 Last month, Skittles announced that, instead of spending money on a Super Bowl commercial this year, they’d be producing a one-night-only theater event starring Michael C. Hall aptly titled Skittles Commercial: The Broadway Musical. So, that happened. But what exactly went down at this unholy meeting of art and commerce? According to a recent summary from Vulture, there was death, candy, and whole helluva lot of meta-commentary. The plot is simple enough: Michael C. Hall plays himself, grappling with the thought of performing in a Skittles musical. Planted audience members get angry at him, ultimately running him out of the theater to his death. Yes, he dies. Then, in the afterlife, he meets up with Amelia Earhart and Winston Churchill to discuss the merits of dying for the sake of candy sales. Throughout it all, Skittles and its storied creative team—playwright Will Eno is a Pulitzer finalist—reiterate how how dumb all of this is. And how dumb they know you think it is, too. With songs like “This Might Have Been A Bad Idea” and “Advertising Ruins Everything,” the musical commercial apparently revels in the kind of corporate post-irony that’s typically reserved for the Wendy’s and MoonPie Twitter accounts. Rather than being an advertisement for the product itself, Skittles Commercial: The Broadway Musical is, in a distinctly 2019-ian twist, an ad for how self-aware the brand is. If they admit that they’re a faceless corporation trying to sell you confections, will you just buy some? Whether or not you find this charming or insufferable—we, having had to wince through a Twitter rap battle between Wendy’s and goddamned Pop-Tarts, fall on the latter end—it’s yet another twist in the ongoing saga of brand engagement in the social media age. Because, as Little Debbie tries to score sales by tweeting about suicide, Skittles is eschewing content and reframing the ad as an experience. Folks, it’s only going to get weirder. The upside of this somewhat masturbatory stunt is that, according to Skittles, ticket proceeds will benefit the Broadway Cares/Equity Fights AIDS charity. So, that’s nice. Check out the full recap for yourself over on Vulture.